Staying active during the cold winter months can be a challenge. The snow, freezing rain, and chilly temperatures make going outside unpleasant, and potentially hazardous. Luckily, there are a variety of exercises and activities that can be done indoors to help with staying fit during the winter. Exercise at a Gym: Utilizing low-impact machines and equipment at the gym is an excellent way to maintain fitness levels and keep active. Ensure you learn how to use each piece of equipment properly and have clearance from your doctor before beginning a new routine. A personal trainer is a great option to help guide you through some workouts that have your capabilities in mind. Participate in Fitness Classes: Many gyms and local gyms and community centers offer fitness classes. These include a variety of activities including cardio, strength training, aqua, and cycling. This also gives you a chance to interact with other members of your community and find people who share similar interests. Exercise at Home: If the weather proves to be too bad to leave your house, you can exercise right where you are. Whether using a DVD of exercise routines or browsing video streaming services to find what you are looking for, there are a variety of options available to you to encourage staying fit during the winter regardless of the weather. Play Active Video Games: Advancements in video game technology have lead to the development of interactive systems and games. These are available to play on the Wii U, the PlayStation through PlayStation Move, and the Xbox through Xbox Kinect. Yoga and Pilates: Both of these varieties of exercise are good for building core strength and flexibility, as well as focusing on balance and breathing. They are fairly easy on the body, and can be enjoyed by people of all skill levels. Swimming and Water Aerobics Classes: As far as low impact full body exercise is concerned, swimming is excellent. 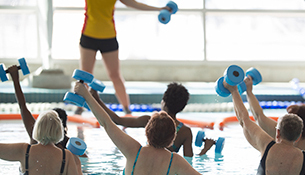 For an even more intense workout, combine the benefits of aerobics with the resistance provided by the water in the pool to help with muscle development. Since your body is buoyant and lifted by the water, you feel lighter and supported. This alleviates the impact you would feel if you were performing the same aerobic exercises out of the pool, allowing you to enjoy the benefits each activity provides even if health conditions would normally prevent you from doing them otherwise. Dancing: Moving along to a favorite song is an enjoyable experience whether done individually or in a class setting. It doesn’t have to be large movements either, simply shaking your hips or tapping your feet counts. Walking: If you choose to brave the wintry conditions and go for a walk outdoors, always be sure that your path is free of ice and snow. If you choose to remain indoors, walking in the halls of your home or apartment, or strolling through a mall are excellent ways to get your exercise in while keeping warm inside. 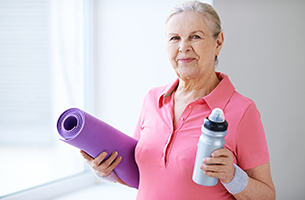 At The Holiday retirement communities, we offer a wide variety of exercise programs to help keep our residents active. Along with our other activities and excursions, there is something for everyone to be involved in. We care about everyone who walks through our doors, and look after our residents like our own family.